Building a deck out of plywood and concrete may seem like solid materials to last a lifetime, yet they’re still vulnerable to deterioration when exposed to outdoor elements. If you live in overly rainy climates, it’s common to end up seeing your plywood warping or buckling. For concrete, too much condensation leads to cracks, hence causing considerable damage to your deck at a dangerous level. The solution to protecting your deck is using waterproof deck coatings designed for plywood and concrete substrates. Perhaps you’ve never had experience with waterproofing, even if you should have had it done when first building your deck. At Pli-Dek Systems, we’ve designed innovative coatings that work for both plywood and concrete decks. While we provide various branded innovations, we frequently receive questions about various aspects. Let’s look at waterproof deck coatings: most common questions answered so you can educate yourself on the process, and learn how it protects. What Else Can Waterproof Coatings Protect From? You already know waterproof coatings help protect your deck from moisture, but it also gives you a three-point protection. When you live in rainy climates, moisture can cause rot on your plywood, and the coatings help act as a shield to give you years of protection. Coatings go beyond this to give you UV protection as well if you live in overly sunny climates. It’s easy to forget that excessive sun exposure leads to deck deterioration as well. Using a high-quality coating additionally protects from scratches on the deck’s surface. Considering you’ll get considerable foot traffic on your deck, protecting it from looking worn helps you with aesthetics several years down the line. How Long Does it Take to Apply Waterproofing Coatings? The time it takes varies depending on the thickness level of the coating, though many of our coatings are easy to apply in a few hours with one-hour drying. Basically, you’re able to use your deck by the next day without problems. Once applied, it’s extremely durable, meaning that if you have a large gathering on your deck the next day, it’s not going to cause damage from excess foot traffic. What Kind of Materials Make for Quality Coatings? Using our coating for plywood, you’ll get a 2.5 galvanized metal lath and a polyacrylic emulsion base coat, bringing the ultimate in durability for this wood type. In a coating for concrete decks, it’s important to use .75 oz. 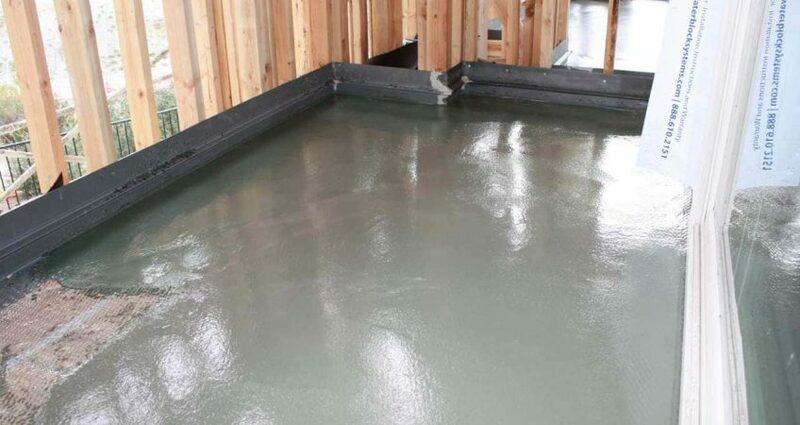 fiberglass mat, elastomeric resin, and a durable polymer cement finish coat to assure full protection. Despite these materials being some of the strongest in the industry, it doesn’t have to stop there. You may wonder about finish options, and you have numerous choices. What Kind of Finish Options Are There? You’ll find many finish options available to use after the coating dries. For decorative purposes, these add a lot to your deck while applying another protective layer. Colors aren’t overly standard either and include unique combinations to let you choose something representing your personality. Choices like Executive Gray to Terra Cotta are available for standout color mixtures. As another option to your waterproofing, fluid-applied coatings do even more to protect against mildew and leak damage. When you apply these, you’re also able to control groundwater in a more efficient way so it doesn’t force you into repairs earlier than you planned. Materials in these coatings include hot rubberized asphalt and polymer modified asphalt only available here at Pli-Dek Systems. Contact us if you need more questions answered about waterproof deck coatings. We’ll answer any question you have about our products and how they continue to save thousands of residential decks every year.